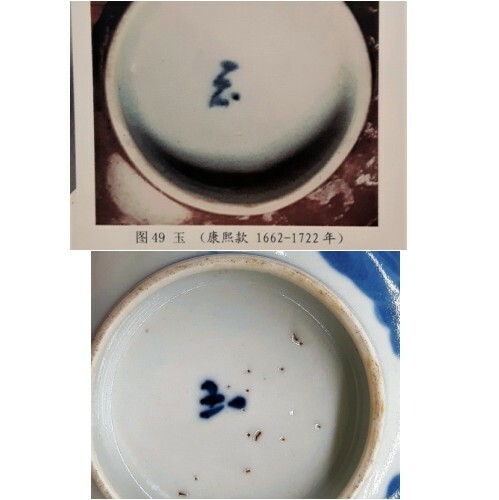 Can someone please tell me if the mark on my bowl is a variation of the 18th c mark shown in my book of Chinese marks (see pics! ), and can someone date my bowl! NOTE: There is a slight difference in hues of the blue glaze in my photos! (sorry!) and thank you! David. Your bowl has a mark of "Jade" (玉), which Gerald Davison's "New & Revised Handbook of Marks on Chinese Ceramics" indicates was in use from the Yuan to Qing periods. 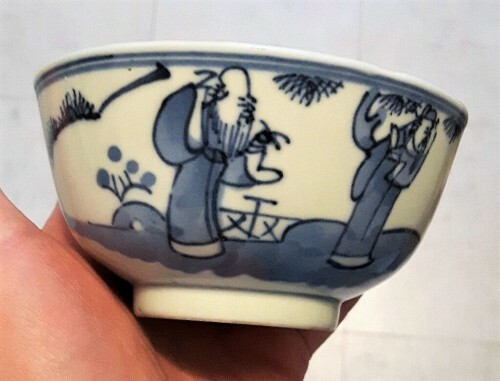 The "Fu-Lu-Shou" (Star God)" pattern on the bowl resembles a style in vogue during the first quarter of the 20th century. 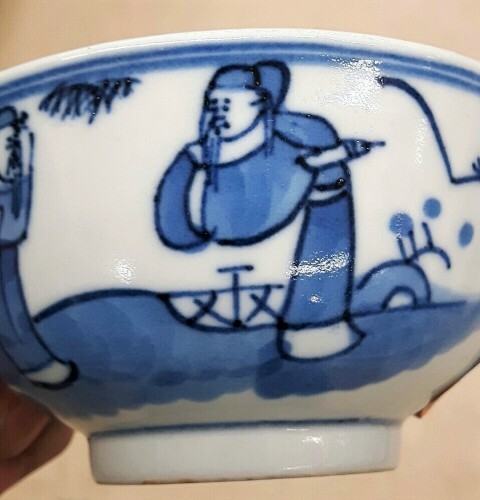 I also have the same pattern on a bowl marked "Guan Yao Nei Zao" (Made in the Imperial Kiln), which can date to the Guangxu Period, as well as another unmarked bowl with the same pitted glaze characteristic as yours. Your bowl may be a circa 1900 late Qing product but made for the domestic Chinese market and not for export to the west if post-1891. Your bowl also could be a post-1911 Republic-period product also either made for the domestic Chinese market or exported under an individual paper label or a crate label. According to Tony Allen's latest book, "Allen's Antique Porcelain - The Detection of Fakes", American labeling requirements for imports were in flux during the World War I years (1914-1918). U.S. companies such as A. A. Vantane were known to have imported many sets of unmarked Chinese dishes in crates. See link for addition information and images. Thank you once again Bill H! Always interesting! David.